For the second time in two years, the world is hovering over its computers and stealing covert glances at the office television, waiting to celebrate an ordinary life milestone of a not-so-ordinary couple. 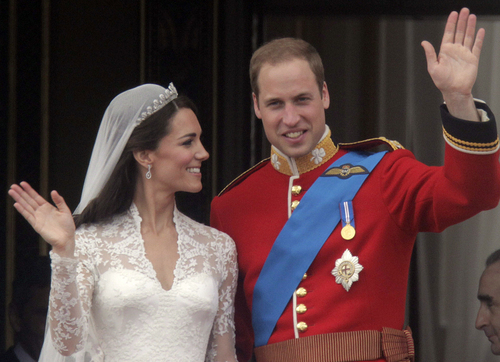 Most of us will never meet Prince William or Duchess Kate Middleton. Most of us will never come within twenty feet of a single person in the line of succession to the British throne – and there are dozens. So why do we waste any of our precious time on Kate Middleton’s wedding dress, or Prince Harry’s partying, or the birth of some foreign child who might inherit an emblematic semblance of power in fifty years? Because as tough and wise and independent and intellectual as we are in the 21st century, we still have a soft spot for fairy tales. They may not be the exact same fairy tales on which we grew up. No longer do we revere the princess who twiddles her thumbs until a man arrives to give her life purpose. Nor do we view a prince’s kiss as a means of placing dibs on a comatose woman – the way a toddler may view licking his LeapPad. Like us, the stories have evolved. But even as we roll our eyes at the notion of “happily ever after” in today’s world, we still remember the childhood stories about true love, good conquering evil, and inner beauty blazing through its cover like a lily through the snow. Deep down, we still hope these things can – even do – exist. Perhaps this is why, 13 years ago, I began envisioning a fictional world that brought these fairy tale princesses together. Every so often during the next decade – through high school, college, and the start of my journalism career – characters and their stories would pop into my head at random, sending me scrounging for a pen and anything I could write on (worst case scenario, the back of my hand). I wondered how Cinderella really felt about going from rags to riches and fame and obligation. I thought about how Sleeping Beauty must have panicked upon waking up decades – possibly centuries – in the future, with a whole new set of expectations. I jotted down notes in the corners of my biology notebooks, on scraps of misprinted pages, and in e-mail drafts that multiplied to unmanageable proportions. I simply had to bring these women to life… and make them friends… in a place that straddled both what we consider reality and what we like to imagine. Consider this the long and short explanation of how Desperately Ever After came about. I’m keeping the details close to the vest while Folio Literary Management works its magic, waiting for the moment when I can unleash all these fabulous women to the world. I never expected that they would become as real to me as anyone with flesh and blood and a birth certificate, but they have. And like William and Kate’s son- or daughter-to-be, they won’t be held back for long. So for one day, while the media lightens its usual doomsday reporting to await a baby announcement pinned to a gilded gate, consider it a sign that fairy tales still have a place in our world – and our hearts.